Maridee Shogren, director of the doctor of nursing practice program in the UND College of Nursing & Professional Disciplines, who along with Thomasine Heitkamp (left) and others, are promoting screening throughout North Dakota and with students at UND through an evidence-based intervention tool known as Screening, Brief Intervention and Referral to Treatment (SBIRT). Photo by Tyler Ingham/UND Today. New screening available throughout North Dakota and the U.S. can help identify risk, intervene and even help prevent substance use disorders. Preventing addiction in the first place is one of the keys to combating the opioid crisis and alcoholism. 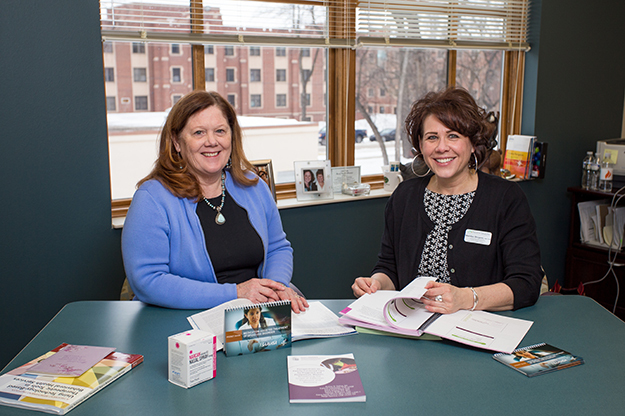 “We’re being proactive instead of reactive,” said Maridee Shogren, director of the doctor of nursing practice program in the College of Nursing & Professional Disciplines, who along with Thomasine Heitkamp and others promoted screening throughout North Dakota and with students at UND. Screening, Brief Intervention and Referral to Treatment (SBIRT) is an evidence-based intervention used to identify, reduce and prevent problematic use, abuse and dependence on alcohol and illicit drugs. The goal is to identify high-risk behaviors and to intervene before users are diagnosed with a substance use disorder. Use of SBIRT screening has the capacity to reduce harmful use of alcohol by as much as 40 percent, and a 55 percent reduction in negative social consequences is possible, according to the Substance Abuse and Mental Health Services Administration. Shogren and Heitkamp are part of a team spreading this message. How often do you have a drink? How many times have you used a prescription drug for a non-medical use? Questions like these give health and behavioral health care providers a “pyramid” of escalating intervention and prevention tools. “We try to get people to think about their use,” said Heitkamp, professor in the UND College of Nursing & Professional Disciplines. In many cases, said Heitkamp and Shogren, a brief intervention and education can prevent progression to substance use disorders. Heitkamp and others are providing training to health care and emergency providers throughout the state. “We’ve also infused SBIRT practices into the nursing and social work curriculum, and some in psychology curriculum,” Heitkamp said. Use of SBIRT screening has the capacity to reduce harmful use of alcohol by as much as 40 percent, and a 55 percent reduction in negative social consequences is possible, according to the Substance Abuse and Mental Health Services Administration. Shogren and Heitkamp are part of a team spreading this message. Photo by Tyler Ingham/UND Today. After SBIRT was implemented in North Dakota, the prevalence of alcohol use went down by 36 percent, and heavy drinking decreased by 43 percent. Plus, for every dollar spent on SBIRT implementation, about $4.30 is saved in future primary care dollars, and $3.80 could be saved in emergency care. 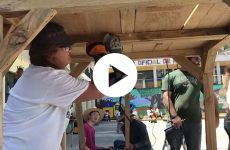 The screening is especially effective in rural areas, which typically have limited access to health care providers and addiction counselors. Shogren, Heitkamp and Christine Harsell, clinical associate professor of nursing, published their work in the November 2017 issue of the Journal of Midwifery & Women’s Health after Shogren was invited by the journal. 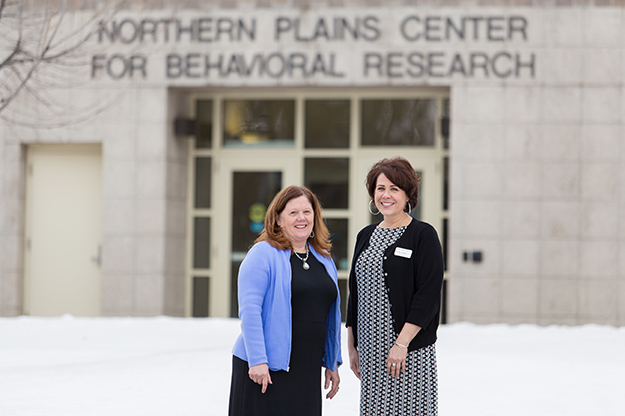 As part of the continuation in their work, SAMHSA awarded a five-year grant totaling $3.8 million to UND to implement SBIRT. 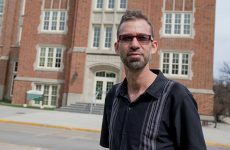 Members of the grant team included Heitkamp, Shogren and Harsell, as well as Angie Muhs, assistant professor of social work; Joe Miller, associate professor of psychology; and Jackie Roberts, clinical assistant professor of nursing. 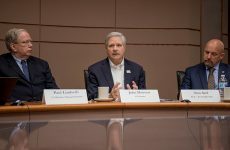 When the grant ended, work continued, and Heitkamp and others continue to provide training to health care and emergency providers throughout the state.